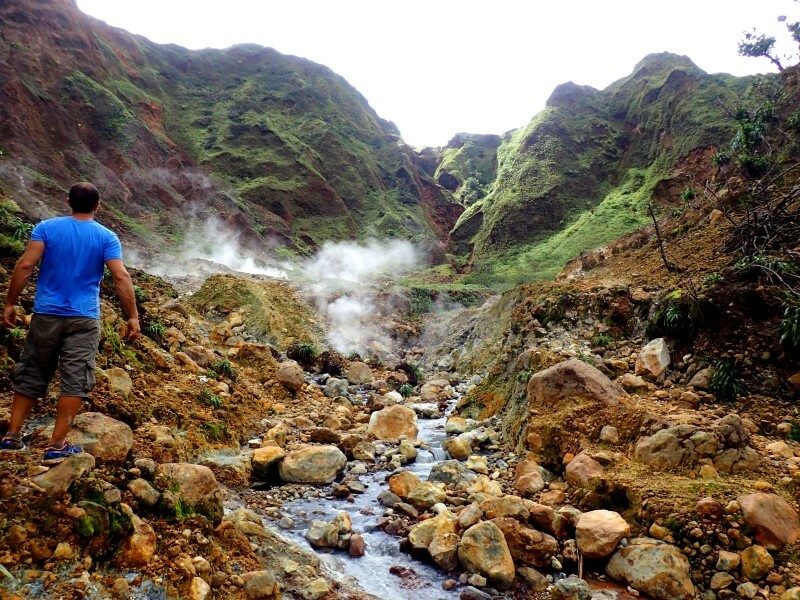 We have described here all the beauties of Dominica, the wildest Caribbean island, but the famous Boiling Lake trail in the middle of the tropical forest deserves a page on its own. 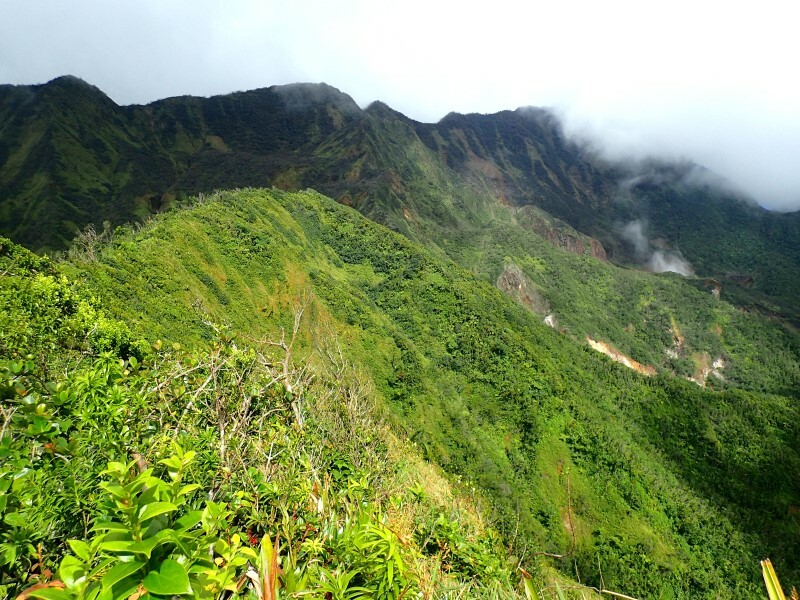 Many hiking lovers visit Dominica only for this trekking itinerary in the magnificent nature of the island. 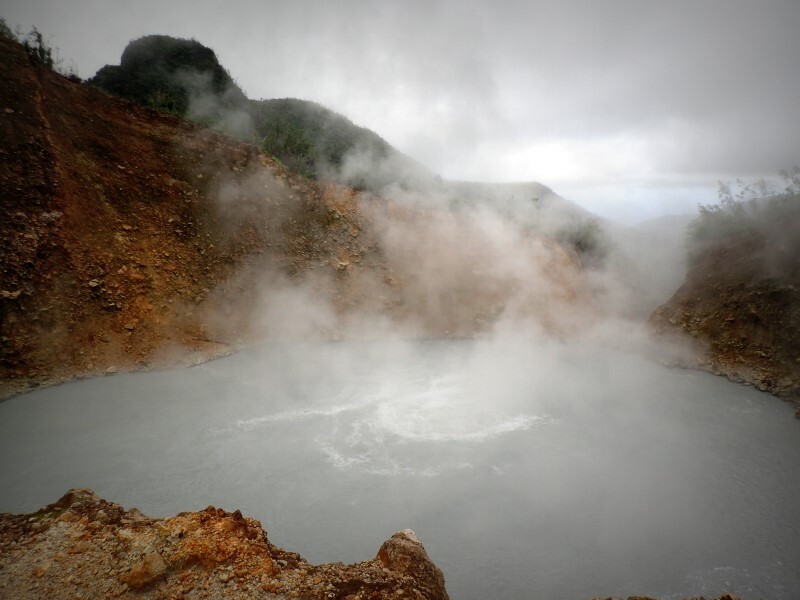 On this page you will find information on how to trek to the Boiling Lake with or without a guide... and yes, although everywhere it is written that a guide is necessary, with the right precautions you can follow this path also by yourself. First of all, the departure of the Boiling Lake trail can easily be reached by car following the signs to the Titou Gorge. The tortuous streets of Dominica and the road signs are definitely not the best, but an offline navigator will help you get there. Indeed, the offline navigation app maps.me also has the GPS track of the trail to the Boiling Lake (with some inaccuracy): this is a very useful source of information (but not enough) for those who want to hike the itinerary without a guide. Once you get to the Titou Gorge, you will probably find some guide waiting for tourists. Despite the fame of the path, you won't stumble into many hikers. I hiked the Boiling Lake trail on the Sunday the 6th of January, so definetely in high season, yet only three or four other small groups reached the boiling lake that day. From the beautiful Titou Gorge, the start of the Boiling Lake Trail is evident and marked by a sign. The first part of the itinerary is all in the tropical forest. Practically impossible to get lost here, very likely, instead, to get muddy! After a rather long but not too steep climb, you go down to a valley crossed by a stream known as the "Breakfast River", because the guided tours stop for breakfast here. On average, you arrive at the Breakfast River after an hour from the start. After crossing the stream, look for the path that goes up towards Mount Morne Nicholls. It is quite easy to find it, because the trace of the path remains evident, but it is also essential not to make mistakes. To that end, having a GPS track on the phone is useful for not having doubts. Anyway, proceed only if you are on a clear path. You climb in the middle of the vegetation, this time on a steeper path, until you get to a muddy ridge. Here it is a good idea not to slip down, because the fall would be a disaster. It is sufficient to walk carefully. The trek to the Boiling Lake proceeds up to the panoramic peak of Mount Morne Nicholls, from which you can also see some houses in Roseau (the capital of Dominica) in the distance and the Caribbean Sea. Coming down from Mount Morne Nicholls, the environment begins to change. In addition to the tropical vegetation, in fact, we start to see the typical colors of the volcanic landscapes and, in the distance, clouds of smoke rising from the ground, including - you can already imagine - the steam produced by the Boiling Lake. The descent on the path becomes steeper but still evident (and also very muddy) until you get a glimpse of the Desolation Valley. Here the landscape becomes undoubtedly volcanic, the soil red, yellow and white, with the air that begins to smell of sulfur. You hike down a gorge, also helped by a rope, and then you arrive right in the Desolation Valley, walking between sulfur fumaroles and small pools of natural boiling water. This is the most difficult part of the path for those without a guide. The trail disappears and you must avoid putting your foot in a hole blowing hot steam. As a general rule, you must go down and follow the stream that flows downstream. Several paths may appear as possible correct routes, and in fact, depending on the upheavals caused by the rains, the best path may change, while others may get lost in the woods or into impossible passages. I was alone and it might have been a good idea to wait for a guided group (in the Desolation Valley I had met a guide who was boiling some eggs in a pool of sulphurous water - I can not say how they tasted! ), but in the end I opted to follow the stream. Once I arrived at an oddly difficult passage, I walked back a little , finding on the right (for those who descend) a path that climbed into the woods. 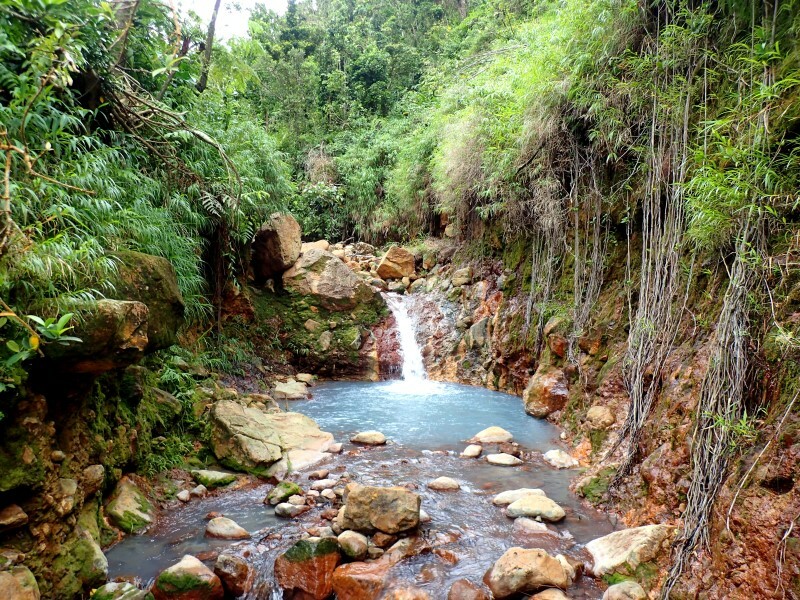 This trail passes through the vegetation, then goes back to the stream (with a rope that helps you to overcome a difficult passage) and you cross the brook in front of a beautiful natural pool. At this point, about two, two and a half hours have passed since the beginning of the path. Ah, keep these puddles in mind to make a nice bath on your way back, so that you can relax in natural hot water. The last part of the trail (that here is again well traced) towards the Boiling Lake starts from the pool in the picture above. 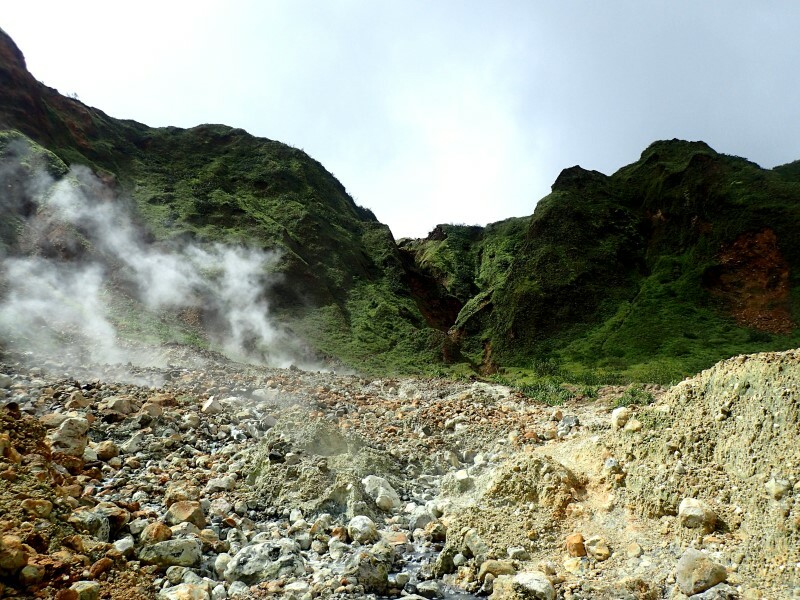 At first you proceed immersed in tropical vegetation, then you arrive at another valley full of fumaroles. Having the GPS track is useful, but even here it is necessary to improvise the path a little bit. You climb between red and yellow and white stones, in the middle of green mountains, and you get closer and closer to the cloud of steam rising from the Boiling Lake. You have to hike up the last hill and, after about 3 hours from the start, you finally get to the boiling lake. Nothing special, maybe, compared to what you had already seen, if not for the extraordinary vision of a large natural body of water at the temperature of 100 degrees. This is said to be the second largest boiling lake in the world. The return is much easier (except for the accumulated fatigue) since you already know the way. In all, I spent 6 hours doing the whole trip, including picnics at Boiling Lake, some short breaks and lots of photos. It is really a bad idea to allow less than 6 hours for this trail. Anyway, I'm a good hiker, but I also had the flu, so do not think that the Boiling Lake trail is a superhuman endeavour. The total altitude gain in the various ups and downs is quite a lot (almost 1000 meters), and it is as tough on the body as any other 6-hour hiking trail on the mountains. Boiling Lake trail without a guide? 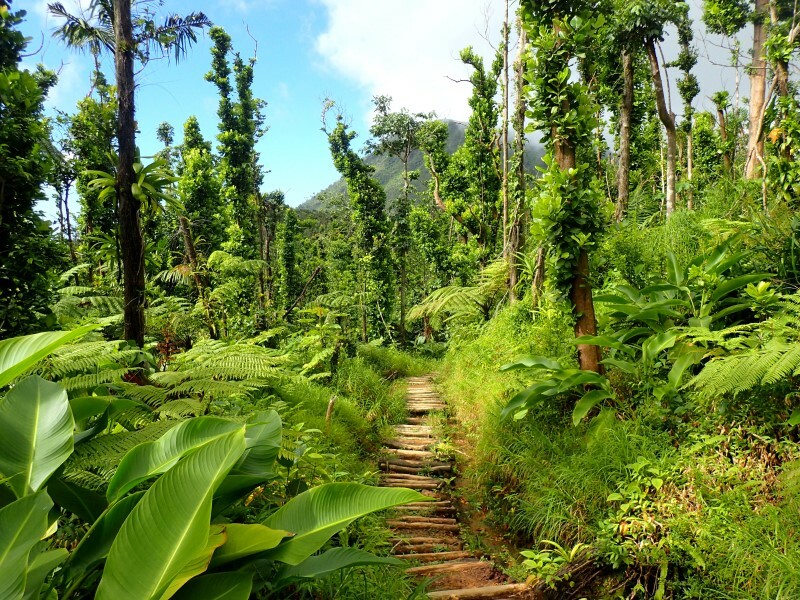 In short, can this wild path in the interior of Dominica be hiked without a local guide? The answer is yes, with some precautions. Having the GPS track is the first one. Making sure there are other groups along the itinerary it is another very important point, even more so if, like me, you are really alone. Third useful suggestion is not to go alone, because if something happens, no one will call for help (and here I was a bad boy). Being in good physical shape, with a sense of orientation and excellent balance is fundamental, because some points are slippery, steep, at risk of falls, and while a guide can perhaps help and point you to an easier path, if you are alone you have to overcome tough passages. As for clothing, keep in mind that you will get dirty and wet (temperatures between 22 and 27 degrees will mitigate this last problem). A k-way and waterproof hiking boots might be useful. Finally: is it really worth doing all this effort to reach the Boiling Lake? Of course!! 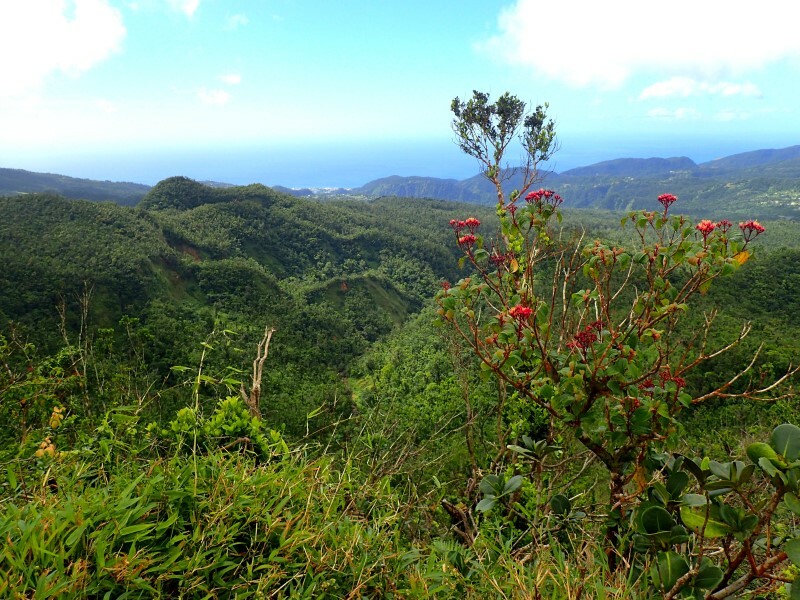 Not so much for the destination, but for the path itself, which gives great satisfaction, allows you to admire the amazing landscapes of Dominica and to immerse yourself in a wonderful adventure... which, without a guide, becomes even more exciting. Go visit this page dedicated to travel itineraries in the Caribbean, and then, besides the page about Dominica, check out Martinique, Guadeloupe, Saint Lucia, Saint Vincent, the Grenadines and Tobago Cays.